I like to call in to a German internet portal (Massengeschmack) just to talk about its program with one of the moderators. 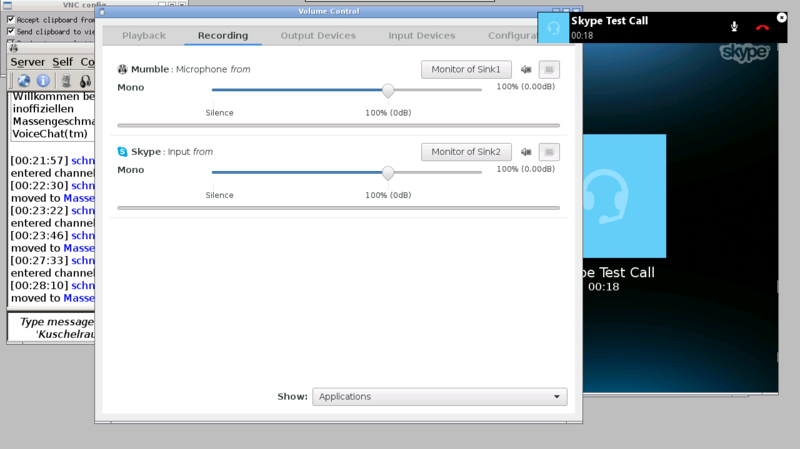 People calling in are restricted to use Skype but the voice chat where fans meet is using Mumble. So what can you do? In this article I will show you step by step how to connect both programs on a dedicated server that has no display and no audio cards available, so a bunch of people can call in. The OS used in this case is Debian 8 (Jessie). 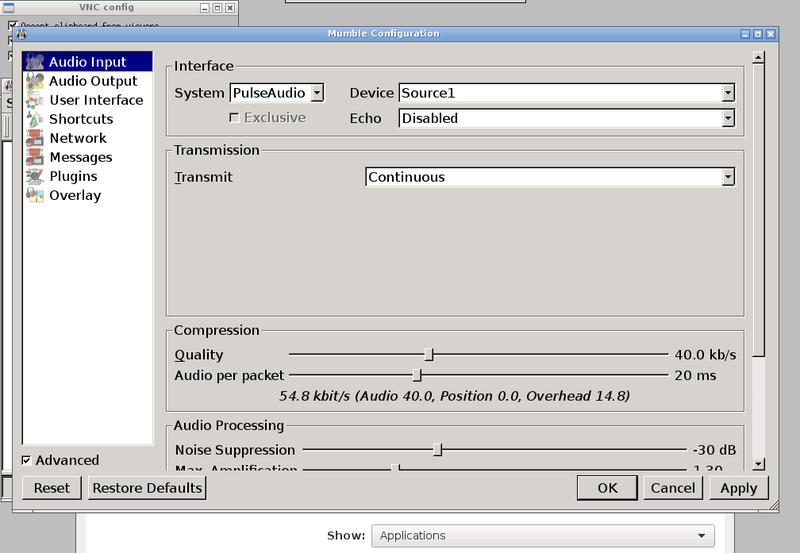 As you can see, two devices will be created for pulseaudio: Sink1 and Sink2. 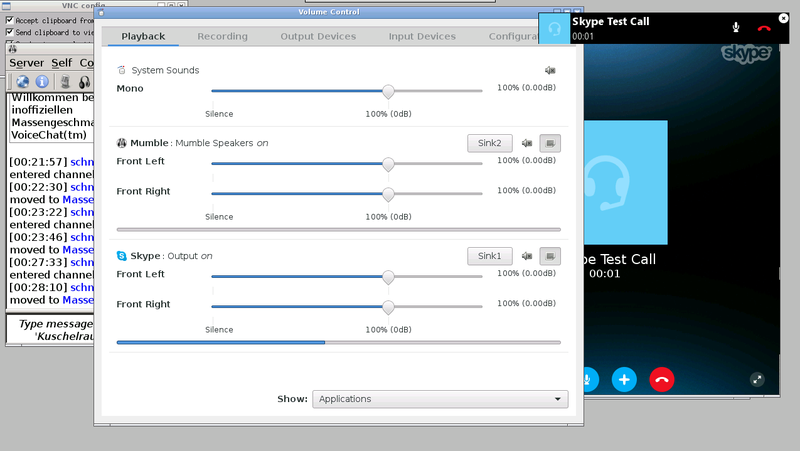 Those transmit audio from Mumble to Skype and vice versa. 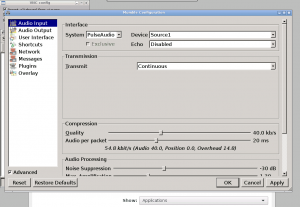 Currently, Mumble has an annoying bug that prevents us from choosing these sinks as a microphone source inside the program, so we also need to load a null source module (microphone) and a loopback module (bridge between Sink1 and the microphone). Attention! Access to port 5912 should be restricted to local connections from the server itself in your firewall! The VNC protocol is unencrypted and can be manipulated from outside very easily. As long as this tunnel is opened you can connect to the graphical interface; e.g. with RealVNC Viewer and the address “localhost:12”. Done! 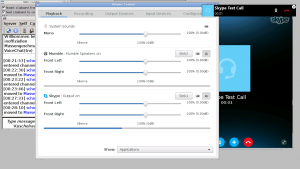 You can start a Skype call now – but bear in mind, that all audio notifications in Mumble and Skype have to be disabled if you don’t want to get annoyed during a call. 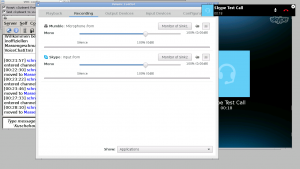 next post: (Telefunken T32K95) No EDID data anymore – so what now?